Hello! This is Christa - I'm taking over the blog posts while Francesca enjoys her summer vacation. I've been busy the past few months: organizing a hooping/juggling/circus festival, training new lifeguards, and moving house, so I'm really happy to come back to my regular shifts and the beautiful calm order of the shop in summertime. Karen had visited Felicia at the Sweet Georgia studio to pick up some treats, and asked me to showcase the new arrivals - feast your eyes on 21 colourways of Cashsilk Lace, a favourite of ours for luxurious special occasion knits! 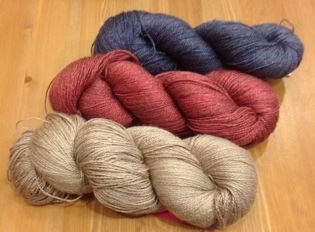 55% silk, 45% cashmere, 400y / 365m per skein. 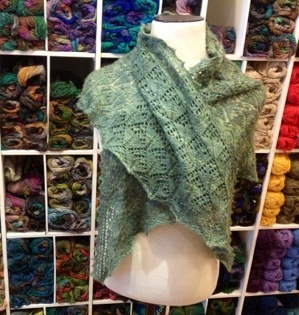 Alison used two to make the beautiful shop sample of the Caricia shawl by Anne Hanson of KnitSpot, shown below. See Alison's notes here, and Anne's pattern here. We love the way the fibres absorb dye and reflect light, and it is a dream to knit and block, but I think that the manufacturing of Seacell is also fascinating: It is a fibre made from combining cellulose fibre from the eucalyptus tree with seaweed that has been dried and crushed to a powder. The two materials are mixed together in a process similar to that which makes Lyocell/Tencel, a type of rayon. (My fibre geek tendencies are showing... Click on those links if you're a fibre geek too!) Seasilk Lace has excellent yardage: 700y / 640m per skein, so one will make a very decently sized shawl, and two will make a lightweight summer tee or tank for most sizes. Hope you're having a wonderful summer of knitting - once I'm unpacked, I'll be back up to my elbows in projects too!